Eating healthy doesn’t mean you have to scrimp on dessert. 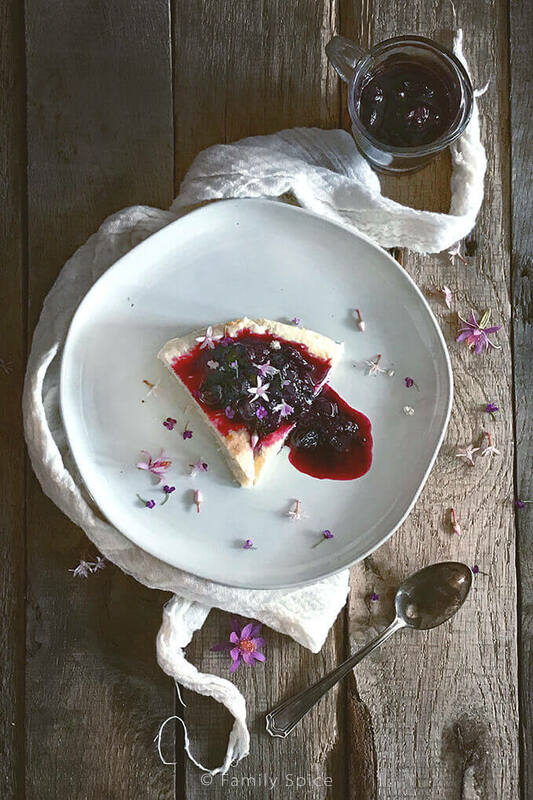 This low carb cheesecake from The Everyday Ketogenic Kitchen Cookbook will satisfy your sweet tooth, without hurting your waistline. This post does contain affiliate links. When you write and photograph food, it’s easy to get sucked into Cookbook Wonderland and stock up on oodles and oodles of cookbooks. But a few years ago I limited the bookshelf real estate to my cookbook collection, in an effort to declutter. Of course, I have found myself busting at the seams again! What’s a foodie to do? 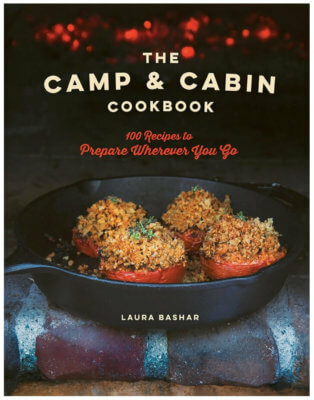 There are so many fabulous cookbooks to choose from that I just can’t resist the temptation and inspiration that you can only find in wonderful cookbook. 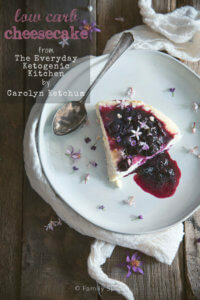 So today I am sharing with you my review of Carolyn Ketchum’s new cookbook, The Everyday Ketogenic Kitchen. Carolyn has been blogging as long as I have, maybe even longer. Her blog, All Day I Dream About Food, is a paradise for those living the low-carb lifestyle. This is no fad diet for Carolyn. She’s diabetic. The low carb ketogenic diet is not by choice, but for serious health reasons. But as Carolyn has explained on her blog and in her book, even if she wasn’t diabetic, she would choose this lifestyle because of how healthy this way of eating is. My family and I are rather lucky. We do not have any food allergies, intolerances or major healthy issues that affect our diet. Any food choices we make are totally voluntary. I have been on a low carb diet on and off in the past, mostly to lose excess weight. And like many others, I started eating low-carb again this January. And honestly, it is a lot easier to do this today than ever before. One of my biggest weaknesses is desserts. I confess to having a sweet tooth. I have dabbled with low-carb baking in the past but found most low carb sweeteners to fail in baked goods. I use stevia daily for my morning tea, and have done this for the past 7 years. But I can’t stand the after taste found when baking with stevia. I have also tried baking with Splenda and monk fruit sugar. Same nasty after taste when baking. Carolyn Ketchum recommended using Swerve on her blog and it changed everything. Carolyn is a magician when it comes to low carb desserts: ice cream, cookies, cakes, pie, brownies… you name it. She found a way to recreate all of these confections and make them low-carb and keto friendly. And we are not talking about tasteless bricks that no one wants to eat. This low carb cheesecake? I had to hide it from my 16-year old Professor because he couldn’t get enough of it. He didn’t care if it was low carb or keto, and he certainly didn’t miss the crust. The Everyday Ketogenic Kitchen cookbook is filled with dreamy recipes, and all are low-carb and keto-friendly: pizza dough, pies, cookies, muffins, pancakes, mousse, smoothies, nacho chips and hot chocolate. And let’s not forget savory delights like soups, smothered pork chops, chicken cordon blue, fish nuggets, eggplant parmesan and spinach-mushroom gratin. Every recipe is clear and easy to whip up and filled with bright photographs and nutritional information. Carolyn explains in her easy-going style all about the keto-lifestyle and gives you wonderful tips to cooking and baking low-carb. She makes it so easy to eat healthy and low carb. I am so confident that you will love this cookbook and Carolyn’s recipes, that I am giving a copy away to one lucky reader. This giveaway is open to US Residents only. Let me know what’s the first thing you would make from Carolyn’s low-carb keto cookbook? Eating healthy doesn't mean you have to scrimp on dessert. 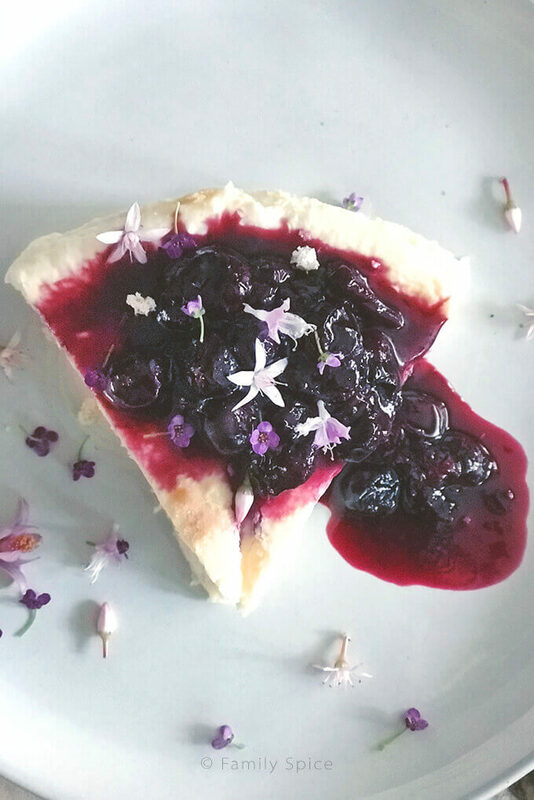 This low carb cheesecake from The Everyday Ketogenic Kitchen Cookbook will satisfy your sweet tooth, without hurting your waistline. Preheat oven to 300ºF and generously grease a 9-inch springform pan, lining the bottom of the pan with parchment paper. Wrap 2 pieces of aluminum foil around the outside of the pan to cover the bottom and most of the way up the sides. Place springform pan inside a roasting pan large enough to prevent the sides from touching. Place the roasting pan in the hot oven and carefully pour boiling water into the roasting pan until the water reaches halfway up the sides of the springform pan. Bake for 70-90 minutes, until the cheesecake is mostly set but stilly jiggly in the center when shaken. Remove from oven then carefully remove the pan from the water bath. Let cheesecake cool to room temperature. Run a sharp knife along the edges of the cake to loosen, then release the sides of the pan. Refrigerate for at least 4 hours before serving. Previous Post: « Move Over Kale Chips… Here Comes Baked Spicy Swiss Chard Chips! I would make the cheesecake or any other version of cheesecake. My daughter loves them all. Mmmm! Give me all the cheesecake! This looks fabulous! ATM, nothing specific, look forward to recipes using coconut flour. Wow, that looks delicious and stunning photos. I would love to try the Slow Cooker Broccoli Cheese Soup recipe first! 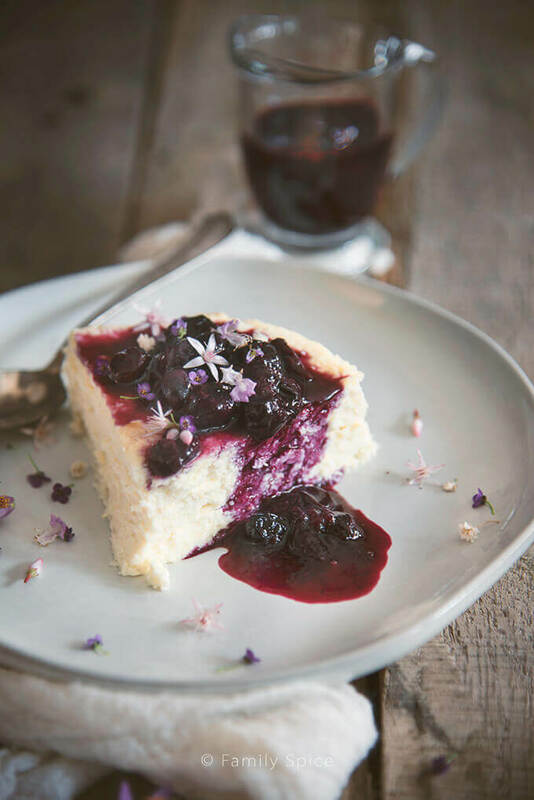 That cheesecakes probably tastes like a little slice of heaven! I’d totally make this cheesecake! Yum! I’ve heard nothing but good things about Carolyn’s cookbook. This cheesecake looks amazing! I want to make that cheesecake!! I would make that cheesecake! It looks delicious! I’d make a keto friendly pizza! !